Introducing the first ultrasonic nebulizers designed specifically for kids, teens and young adults. Each unit comes with a stylish tote bag that features either a green camouflage print or pink. These are Ultrasonic Nebulizers, capable of dispersing medicine in a superfine mist. 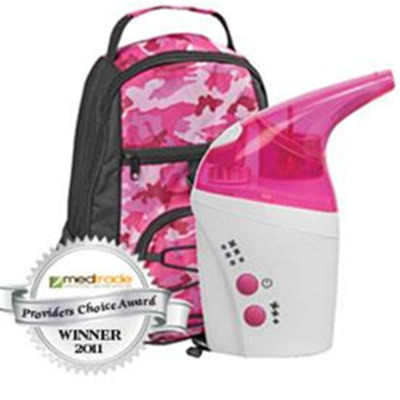 The NebPak is the perfect Respiratory Therapy apparatus for school age children, because the stylish totes resemble a backpack. Ideal for school, sports or extracurricular activities. Battery life is 20-30 minutes of continuous use per charge. Includes:Mouthpiece, Extension tube, Connector, Nasal Piece, Adult Mask, Child Mask, Medication cups, Air Filters, Nebulizer stand, Rechargeable battery pack, AC adapter, DC adapter & Tote bag. Please note that this is an ultrasonic nebulizer that should not be used with Budesonide (Pulmicort®). Budesonide should only be used with a jet (compressed air) nebulizer.